Once considered a reclamation project at best, Baltimore’s Chris Davis is hitting the ball at MVP levels. For the first 1,495 at-bats of his career, Chris Davis looked like a thousand big, lumbering, mediocre sluggers before him. He didn’t run well and didn’t field well. He had a terrible batting approach, one that could best be described as swing for the moon, then offer every fan on the third-base side a nice, cool breeze. Sure, he would close his eyes and launch balls fairly often. But those home runs felt like empty calories, brief flashes of good feelings that ultimately gave way to replacement-level regret. There has been nothing empty about what has happened since. More than one-third of the way through the 2013 campaign, it’s Davis — not Miguel Cabrera or any of the superstars you’d expect — who leads the majors in virtually every advanced offensive metric imaginable. Davis is hitting .356/.436/.740 so far in 2013. On a park-, league-, and era-adjusted basis, that’s tied for the 19th-best season in baseball history. The guy who most closely resembled players like Jay Gibbons and Phil Plantier through age 26 is hitting like Babe Ruth at age 27. Like a real-life Pedro Cerrano, Davis’s bat was sick when he joined the Orioles in the summer of 2011. Last year in particular, he could not hit curveball; straight ball he hit very much. Here’s an example. July 29, 2012, A’s left-hander Travis Blackley is pitching, with Davis leading off the bottom of the fourth inning. The count goes to 0-1. Blackley throws a hanging curveball at 73 mph. Davis strides way too early, putting himself way off balance and sapping his power potential by the time the pitch reaches the plate. The result is a weak groundout to second. Fast-forward to September 18, 2012. Mariners righty Erasmo Ramirez is pitching, top of the seventh, Davis leading off the inning, 1-2 count. Ramirez fires an 80 mph changeup. It’s a beauty — a sharp sinker that disappears around Davis’s ankles. At any rate, Davis is badly fooled. He’s all but completed his stride by the time the ball is on him, with his hands already lunging through the zone. If he’s going to make contact, it’s going to be a tapper somewhere at best. Instead, he whiffs for strike three. Davis had two major flaws he needed to fix if he was going to become something more than the next Cerrano, sans Jobu. Those two problems were largely related. At some point along the way to at-bat no. 1,495, pitchers figured out that Davis had light-tower power, but also that he could be exploited with off-speed and breaking pitches low and away. Of course, baseball history is littered with examples of similar players, many of whom never could figure out how to solve the curveball-in-the-dirt problem. Easier said than done. Near the end of last season, Presley came to Davis with a suggestion. Davis was maniacal in his batting cage work, often taking 200 or more huge hacks in a session against pitching machines. What if, Presley suggested, Davis started hitting off a tee instead? And what if he took, say, 60 swings per session instead of 200? The drill would go as follows: Presley sets up six hoops as targets, one low and on the lefty-swinging Davis’s pull side, one high and on Davis’s pull side, one low and up the middle, one high and up the middle, one low and the other way, one high and the other way. Presley believed that athletes are visual learners, that hitting off a tee would encourage a more consistent, line-drive swing, and that aiming for each of the targets would drill home the message of using the whole field, going wherever a pitch takes you. Before coming to the Orioles, Presley had served four and a half years with the Marlins. One Marlin in particular loved the hoop drill, practiced it all the time, and excelled at it: Miguel Cabrera. “Let’s try it,” Davis said. He took to the drill right away, spraying line drives everywhere and saving more energy that he could then take out onto the field. After hitting a decent .265/.321/.465 with 26 homers in 132 games, Davis went nuts in his final seven games of the season. In what was easily the greatest stretch of his career to that point, he smacked seven homers in that final week, hitting .360 with a .407 on-base percentage, slugging a ridiculous 1.200. Both Davis and members of the O’s organization reel off other theories for his success. He’s incredibly strong and uses a 35-inch, big-barreled bat, which Presley says allows Davis to reach outside pitches and hit them with authority to left and left-center, especially now that he’s improved his batting eye. General manager Dan Duquette cited his age, noting that baseball players often find the right balance of physical skill, baseball smarts, and emotional maturity around their mid-to-late 20s.1 Some cited Davis getting married last summer, noting that he’s at a good place in his life. Back when he was publishing his essential Bill James Baseball Abstract in the ’70s and ’80s, James studied age curves to see when hitters typically peaked. The magic number turned out to be 27. Though more recent studies have argued that hitters might peak slightly later, 27 remains at or at least near the age agreed upon as the top of the bell curve. Davis turned 27 on March 17, 2013. Still another explanation was playing time. Davis had struggled to get on the field in the past, with a high of 113 games and 419 plate appearances in his second big league season, back in 2009. In the two seasons that followed, he played in a total of just 104 games, ending that stretch in Baltimore after the July 30, 2011, deal that netted Davis and then-struggling swingman Tommy Hunter for setup man Koji Uehara and cash. He started hitting better last season once granted a more or less everyday job; Davis posits that regular reps helped him learn how to control his own swing and how pitchers approach him, while Presley claims that no longer living in fear of being benched after an 0-for-4 day did wonders for Davis’s confidence and peace of mind. Buck Showalter has a different theory: Davis has always had this in him, it just took some time for everything to come together. In 472 minor league games, Davis hit a gaudy .318/.375/.597, smashing roughly one home run for every 15 at-bats. Even chalking some of that up to playing in the hitter-friendly California, Texas, and Pacific Coast leagues, Showalter believes the Orioles landed a 6-foot-3, 230-pound sleeping giant when they struck that deal with the Rangers. That trade, and Davis being given a chance to play every day, might have never happened if the O’s hadn’t been terrible yet again in 2011, going 69-93 for their 14th losing season in a row. But Showalter says Davis would have eventually experienced a breakout on almost any team. • His home runs haven’t been flukes, or wall-scrapers. Davis is averaging 410 feet on his 20 home runs this season, and only six of them have gone less than 400 feet. Three of those six have gone at least 396 feet. He’s in the top 20 in average home run distance this season, 10th-best in average distance among the 45 players with 10 or more homers. His average fly ball distance is the longest it’s been in three years, at 306 feet. • For most of last season (and really much of his career), Davis was opening up his hips early to catch up to the fastball; as a result he struggled to adjust to breaking balls. On September 26, 2012, he homered twice, with both bombs coming on breaking pitches, and both with two strikes. He stayed back on each pitch and hit both out to center field. Counting those blasts, 14 of Davis’s 27 home runs since have come on pitches on the outer third of the plate, or farther outside. This season he leads all of baseball with 63 hits and 18 home runs on pitches down the middle or away. • Since that September 26 breakout game, he’s swinging less often, chasing pitches out of the strike zone less often, and seeing a lower percentage of pitches thrown in the strike zone. As a result, Davis owns an 11.8 percent walk rate that’s a personal best and well above his career mark of 7.2 percent. He’s also destroying pitches in the strike zone. Now have a look at two of Davis’s league-leading 20 home runs, and how Davis’s newfound ability to stay back on slower pitches has paid dividends. The first one comes from May 12, with Twins left-hander Scott Diamond pitching. Diamond has fallen behind on Davis 3-1. The pitch you would typically expect in that kind of count is a fastball. Partly because first base is open, partly because Davis has a reputation for pummeling fast fastballs, and partly to try to throw him off-balance with an unexpected pitch, Diamond delivers an 82 mph changeup. Davis watches the pitch, keeps his hands back, takes a nice, easy swing … and annihilates it, the ball sailing well beyond the 403 sign in dead center for a two-run homer. OK, that’s Scott Diamond. Let’s see Davis do that against a better pitcher. Here he is facing CC Sabathia on May 20. Davis runs the count full. Sabathia doesn’t want to give in with a fastball. So he throws an 81 mph slider instead. Davis waits, waits … and mashes the pitch deep into the seats in right-center for a solo shot. Whatever pitchers used to do to get Davis out, it sure as hell isn’t working anymore. It’s easy to get carried away with what Davis has done. At a time when the market for baseball nicknames has become a vast wasteland, the “Crush” Davis moniker — a nod to Davis’s prodigious power and a tweak of Kevin Costner’s character name in Bull Durham — looks pretty damn spot-on. Davis T-shirts have fetched jaw-dropping price levels on eBay. True Davis aficionados may peg him as a two-way threat, with his one major league appearance as a pitcher resulting in two scoreless innings, and a win, in the Orioles’ 9-6 decision over the Red Sox on May 6 of last year. Though he hasn’t shown off his pitching skills this year, Davis’s bat has been the biggest reason that the O’s find themselves right back in the thick of the AL East race. He has turned even the biggest skeptics into believers. Jonathan Bernhardt, a writer for Sports on Earth and lifelong O’s fan who uses a picture of an angry Oriole as his Twitter avatar, remembers his reaction when Baltimore traded Uehara and cash for Davis and Hunter. Uehara was (and still is) one of the top setup men in baseball. The day after the Uehara deal, the Padres traded their other elite setup man, Mike Adams, also to the Rangers. In exchange, San Diego got two promising pitching prospects in Robbie Erlin and Joe Wieland. Comparing the two trades, some savvier Orioles fans felt they had been ripped off. It is still only (early) June; far too early to prorate Davis’s stats out to October and pencil him in for a Babe Ruth–caliber season. So far, 30.8 percent of the fly balls Davis has hit this season have gone for home runs. 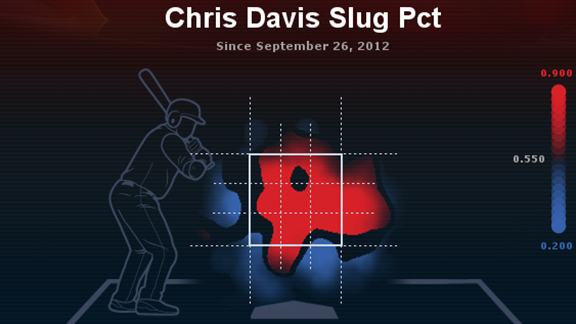 Yes, Davis is exceptionally strong, and sure, maybe he has figured out how to control the strike zone. But if that HR/FB rate holds, it would be the eighth-highest result for any full-time player since that stat started getting tracked in 2002. 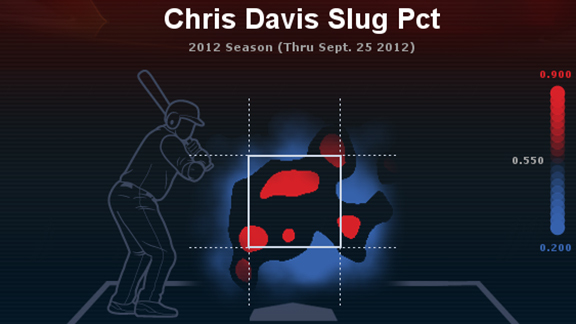 It would lap Davis’s career mark of 20.9 percent and even his sky-high rate of 25.2 percent in 2012. One sign of progress this year has been a sharp drop in Davis’s strikeout rate, from about 30 percent in 2011, 2012, and for his career to 23.0 percent this season. Still, it’s nearly impossible for a hitter to bat .356 all year while striking out nearly one-quarter of the time. As it turns out, there’s an excellent reason for that lofty batting average: Davis is hitting .409 on balls in play (i.e., the ones that have not sailed out of the park), the second-highest BABIP in all of baseball. Davis owning a high BABIP isn’t completely nuts, given that he ranks among the league’s most prolific line-drive hitters, a skill he has owned throughout his career. But again, some perspective is in order. If Davis’s .409 batting average on balls in play were to hold, it would tie for the eighth-highest mark by any hitter since 1900. So yes, some regression might be in order. But that doesn’t mean we should expect him to fall apart. We have mounting visual and statistical evidence that he has made important adjustments — spitting on pitches he can’t hit, staying back on pitches he can, and rocketing them all over the ballpark when he does. Chris Davis is a player, and he crushes a lot.